I don’t feel strongly about praying. But if I were a mountain sports enthusiast and/or lived in Bend, Oregon in the shadow of Mt. Bachelor, I wouldn’t be opposed to asking a higher power for some meteorological assistance. I surely would have no qualms about associating snowsports with (responsible) beer drinking. 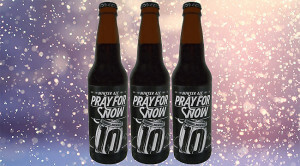 Bend’s 10 Barrel Brewing Co. website says, “We care about two things in winter…snow & beer.” That simple statement says a lot about the wintry brew. 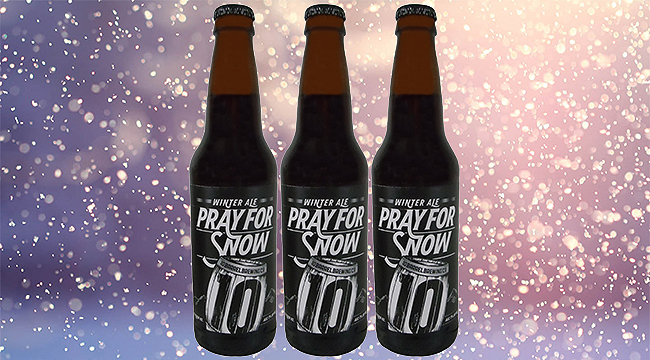 In fact, if Pray For Snow wasn’t so delicious, that might be all you need to know about it. But this malty, well-balanced, and subtly spiced Strong Ale manages to combine complexity and punch that might make anyone sampling a bottle—even before Halloween, as we did—pine for snow-covered backcountry terrain. The Winter Warmers are coming—roasty, toasty, malty goodness that isn’t “sessionable,” but lends a certain comfort as the advancing season inexorably mandates we hunker down by the fireplace at our homes (or, if we’re lucky, at our nearest ski lodge). Stay tuned to Whopperjaw for more reflections on our favorite winter ales. And don’t be shy – make sure you suggest your favorites cozy quaffs in the comments section.